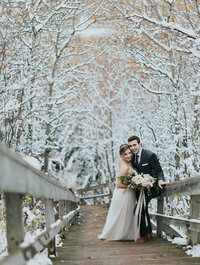 When you think October wedding, you don’t generally think about a winter wonderland but that’s what we woke up to for Jessica & Marc’s art gallery wedding. The leaves had turned colour and then we got a blanket of fresh snow, the pretty kind that sticks to the trees and really just blankets everything. 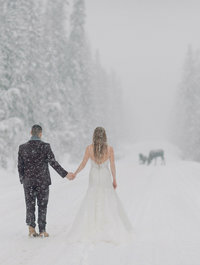 We were set to do a first look after getting ready and I was so intent on shooting in that gorgeous snow. We found a little pathway that hadn’t been used much yet for the first look. I really enjoy capturing the first time the couple sees in each and can actually take time to enjoy the moment. We brought the wedding party down the hill for portraits with the whole group before wandering off to the fabulous staircase for photos with just Jessica & Marc. The canopy of trees with the fresh snow was just spectacular! Finally we got in out of the cold for more photos and eventually ended up at the Art Gallery for a few more photos before the ceremony started. The lobby was the perfect spot for the art gallery wedding with all those big windows. Following the ceremony we headed straight into cocktails and the reception which was beautifully decorated! Here’s some of my favourite photos to tell the story of the day from Jessica & Marc’s Edmonton art gallery wedding this past fall! And check out their Edmonton Ice Castle engagement session too! Are you planning to get married? 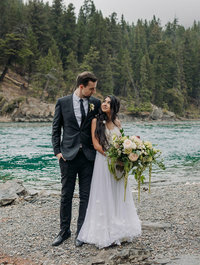 Are you having an Art Gallery wedding in Edmonton? ENV Photography would love to be the one to capture your Edmonton art gallery wedding! 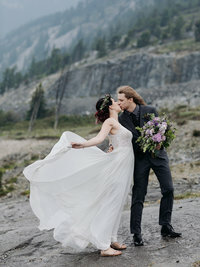 Please get in touch for more information on weddings & engagement sessions in Edmonton, Banff, Lake Louise and other destinations. If you aren’t in the market for an Edmonton Engagement photographer or an Edmonton Wedding Photographer, ENV Photography also photographs maternity, kids & families!